NEW PRICE! 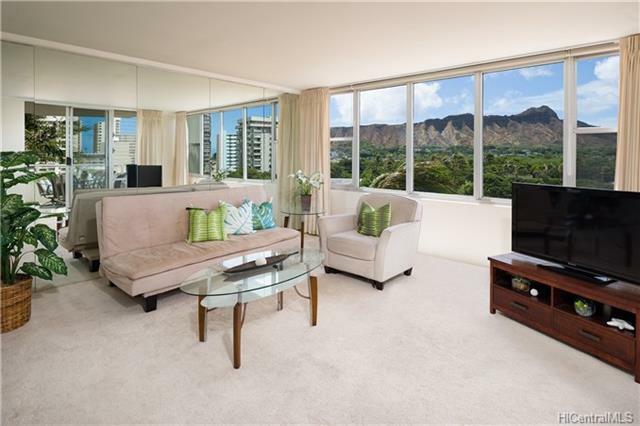 A light-filled and breezy 2 bedroom unit in Waikiki with "can-not-get-better-than-this Diamond Head views!! Preferred, two bedroom stack with extra window in the kitchen; large and open lanai accessible from both living room and the master bedroom; popcorn ceiling removed, gated garage with ample guest stalls, designated car wash area by loading, helpful longtime onsite manager, Nice boutique condo at the east end of Waikiki in close proximity to Kapiolani Park and 2 blocks from the beach and Kalakaua Avenue.